Terminators, who want to install their own equipment in Turkmenistan, are interested in the internet quality issue and its rate as their incomes depend on it. In terms of the number of World Wide Web users, Turkmenistan takes one of the last places in the world. According to the UN, slightly more than 5% of 5.4 million people, who live here, use the Internet And this is the lowest levels, compared with other CIS countries. The main reason for this lies in state policy of Turkmenistan and the monopolization of local service markets. All media are thoroughly and the Internet sphere is controlled. It is forbidden to use a number of international sites that undermine the citizens' trust in the authorities, according to politicians, as well as almost all social networks. The country is among the top 10 countries that provide low internet quality. According to Pando Networks (the company that explores the Internet around the world), the speed of file downloads (only 72 KB/s) in Turkmenistan has been one of the lowest for a long time. By 2015, the maximum available speed had been 1 Mb/s, while in other countries it was 100 MB/s! GoAntiFraud offers great opportunities for GoIP, EjoinTech & ChinaSkyline, Topex users who do GSM termination. We provide efficient tools for the protection of SIM-cards from AntiFraud systems so your business will make more profits. You can buy a standard GoAntiFraud license or take advantage of our offers NewBusiness for beginners and Corporate Solution for GSM termination professionals. On the other hand, the speed is enough to place your GoIP gateways but it is best to install the devices in the major cities of the country and connect to companies that provide the highest quality services. It is necessary to consider that the monopoly on the supply of wired Internet traffic belongs to "Turkmentelecom" or Turkmenistan Online. In 2013, AGTS (Ashgabat urban telephone network) was established to ensure competitiveness in the market, with tariffs remaining high for a long time. However, in recent years, "Turkmentelcom" created a number of packages for customers that increase in internet speed of 128 Kb/s to 256 Kb. This rate is not enough to install GoIP 32 but it is suitable for the use of VoIP equipment that has a few channels. When connected to the most expensive package, you can enjoy unlimited internet for $2.85 a month. In another package, the provider offers a monthly bonus - 500 MB when you pay $17.12 a month. How much is it expedient to install VoIP equipment in Turkmenistan? Originator companies offer an average of $ 0.06 per minute in this area. 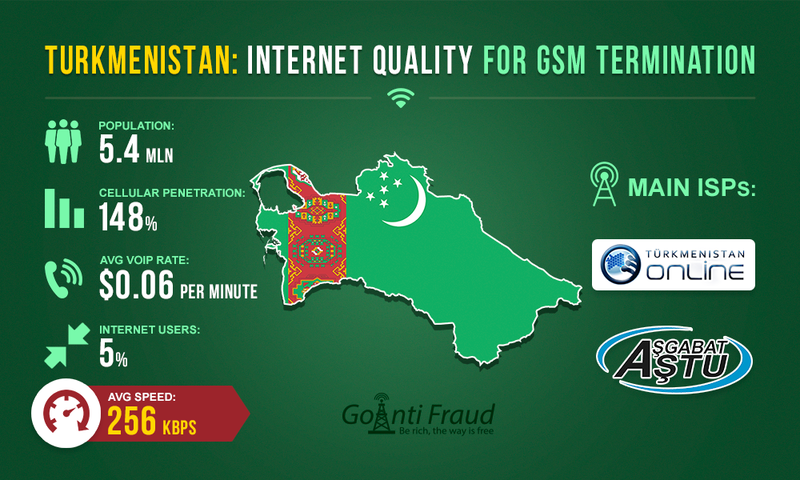 VoIP termination in Turkmenistan is profitable and you can make about $1,000 a month if you provide reliable protection of SIM cards against AntiFraud systems. GoAntiFraud is a cloud service for both VoIP GSM termination professionals as well as for start-up entrepreneurs who have decided to start a business in this area. We offer a comprehensive solution to bypass AntiFraud systems, workflow automation and remote control over GSM gateways/SIM-banks. Our company also sells GoIP, EjoinTech & ChinaSkyline equipment for businesses of all sizes.